You are here: Home 2017 July How to Connect Laptop to Router Console Port with Ethernet RJ-45 Console Cable? How to Connect Laptop to Router Console Port with Ethernet RJ-45 Console Cable? Look at your Cisco router or switches, you will find that every Cisco router or a switch has a console port (also known as the management port) on its back side. The Console port is used to connect a computer directly to a router or switch and manage the router or switch since there is no display device for a router or switch. Do you know how to use this console port? How to connect the Laptop to your router Console Port? Learn More: How to Connect to a Cisco Standard Console Port (RJ-45)? In this article we will share the detailed steps to connect Laptop to router console port. Plug the serial DB-9 end of the console cable into the serial DB-9 port on your laptop. 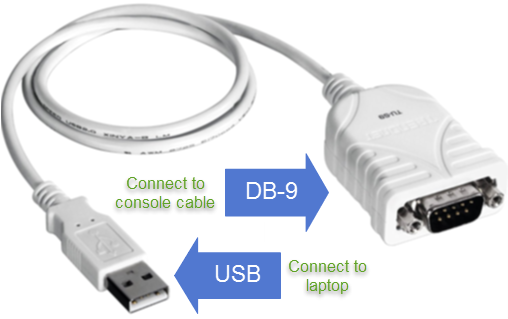 If your laptop has no serial DB-9 port, plug the serial DB-9 end of the console cable into the serial DB-9 end of a USB to serial DB-9 adapter and then into a USB port on your laptop. NOTE: If you use a USB to serial DB-9 adapter, install the adapter driver on your laptop according to the adapter documentation. Plug the Ethernet RJ-45 end of the console cable into the console port on the router. The console port is usually labeled CONSOLEor CON/AUXon Cisco routers supported for dCloud use. NOTE: If you need help locating the console port on your router, refer to the router documentation. Troubleshooting: If you are using the ATEN USB Serial Adapter with Mac OS X Lion, there are known issues with getting the adapter to work correctly. Contact Cisco dCloud Support for assistance.